At the arrival hall of Shanghai airport be greeted by our Shanghai guide and sent to your hotel. The rest of day is free at your own leisure. After breakfast at the hotel, you will visit the Yuyuan Garden, a typical southern Chinese classical garden with beautiful garden settings. Then we will pay a visit to Shanghai Old Street southwest of Yuyuan Garden. Just similar to Hutongs in Beijing, it is the right place to learn about local ordinary’s life. In the afternoon, come to the symbol attraction-Oriental Pearl TV Tower to have a bird’s view of the city. Then move on to the Shanghai Museum, a first-rate museum in the world, a good wonderful primer on ancient Chinese culture. Next is the Jade Buddha Temple, famed for the two jade Buddha statues imported from Burma. The day will conclude with a walk down Nanjing Road, Shanghai’s premier shopping street. The evening view is especially charming. Travel to the nearby city-Suzhou, a heavenly beautiful city, famed for the classical gardens. In Suzhou, we will see the Master of the Nets Garden which is among the finest gardens in China, and the Shantang Street, which is regarded as the “No.1 Ancient Street in China” due to its prosperousness. Then transfer to the Zhouzhuang. Zhouzhuang is a water town which is reputed as the “Oriental Venice”. Take a boat cruise through the village to appreciate the distinct beauty of China watertown. Drive back to Shanghai airport and fly to Guilin. Upon arrival, Guilin airport transfer to hotel for overnight. Drive to Longsheng to experience the local minority culture. We will visit the Longji Terraced Field. A vast region of rice terraces stretches layer upon layer up to the top of the mountain, giving amazing scenery. Dotting all along the rice terraces are Zhuang and Yao Minority Tribes. Their unique costume and lifestyle are impressive. 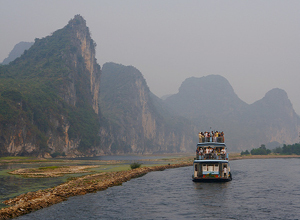 Today you will cruise down the picturesque Li River and reach Yangshuo county. The Li River scenery is reputed as the most beautiful in China-the gorgous karst peaks, blue sky, crystal clear water, fisherman on bamboo rafts, rice paddies with water buffaloes, etc. Arrive in the Yangshuo county. Here you can have a good taste of the idyllic life far removed from the concrete metropolis. Take a biking tour to better feel the county’s charm. Elephant Trunk Hill is the symbol of Guilin city. It is so called because the shape of the hill looks like an elephant drinking water from the river with its long trunk.The Fubo Hill is a solitary peak with wonderful landscape as well as some historical relics and legend. The summit offers a panorama of Guilin. Reed Flute Cave creates heavenly scenery by the different stone formations, enhanced with advanced lighting system. Be transferred to Guilin airport and end of our service.